We offer accurate and reliable product testing to insure your highest quality standards. At BRL we provide a variety of tests that are individually designed to best demonstrate your product's performance. Our team of experienced scientists can assist you in meeting state and federal requirements. 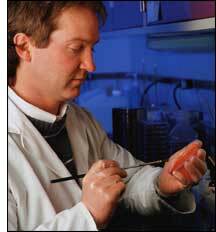 Bio Research Laboratories, Inc. is an Accredited Laboratory by the state of Washington Department of Ecology, No. C073, and operates an animal research facility under U.S.D.A. license No. 91-R-0043. We are also the only lab accredited for rat LD50's and other specialty small animal assays in Washington state. Copyright © 2015, Bio Research Laboratories, Inc. All rights reserved.